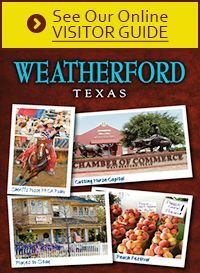 Come enjoy the small-town charm of Weatherford and immerse yourself in the sights and sounds of the season. 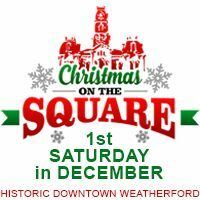 Christmas on the Square takes place the first Saturday in December. The annual Christmas parade kicks-off the festivities at 10:00 am. Take advantage of the great shopping and special treats available in the downtown stores. Vendors and stores will offer special prices and sales, so you can stock up on Holiday gifts while you enjoy the festive atmosphere! There are lots of fun, family-friendly activities for all to enjoy. Take a minute to sit back and enjoy the live entertainment stages that will showcase holiday music and talents. Kids will love the activities in the Kids' Area, the mini-train rides, ice sculpting demonstrations, inflatables and roaming Christmas characters like the Grinch and Gingerbread Man. Admission and parking are free! For vendor information contact the Chamber office.